Machine learning is a subfield of artificial intelligence (AI). The goal of machine learning generally is to understand the structure of data and fit that data into models that can be understood and utilized by people. Although machine learning is a field within computer science, it differs from traditional computational approaches. In traditional computing, algorithms are sets of explicitly programmed instructions used by computers to calculate or problem solve. Machine learning algorithms instead allow for computers to train on data inputs and use statistical analysis in order to output values that fall within a specific range. Because of this, machine learning facilitates computers in building models from sample data in order to automate decision-making processes based on data inputs. Any technology user today has benefited from machine learning. Facial recognition technology allows social media platforms to help users tag and share photos of friends. Optical character recognition (OCR) technology converts images of text into movable type. Recommendation engines, powered by machine learning, suggest what movies or television shows to watch next based on user preferences. Self-driving cars that rely on machine learning to navigate may soon be available to consumers. Machine learning is a continuously developing field. Because of this, there are some considerations to keep in mind as you work with machine learning methodologies, or analyze the impact of machine learning processes. This article discusses the common machine learning methods of supervised and unsupervised learning, and common algorithmic approaches in machine learning, including the k-nearest neighbor algorithm, decision tree learning, and deep learning. We’ll explore which programming languages are most used in machine learning, providing you with some of the positive and negative attributes of each. Additionally, we’ll discuss biases that are perpetuated by machine learning algorithms, and consider what can be kept in mind to prevent these biases when building algorithms. In machine learning, tasks are generally classified into broad categories. These categories are based on how learning is received or how feedback on the learning is given to the system developed. 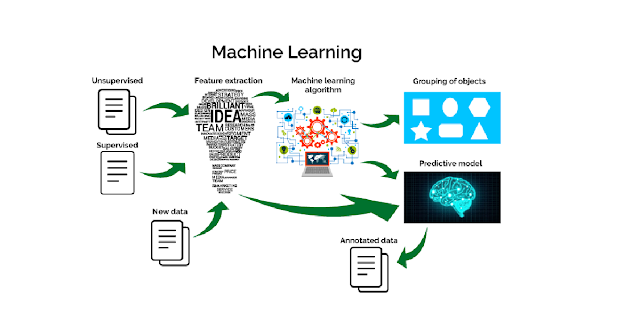 Two of the most widely adopted machine learning methods are supervised learning which trains algorithms based on example input and output data that is labeled by humans, and unsupervised learning which provides the algorithm with no labeled data in order to allow it to find structure within its input data. In supervised learning, the computer is provided with example inputs that are labeled with their desired outputs. The purpose of this method is for the algorithm to be able to “learn” by comparing its actual output with the “taught” outputs to find errors, and modify the model accordingly. Supervised learning therefore uses patterns to predict label values on additional unlabeled data. For example, with supervised learning, an algorithm may be fed data with images of sharks labeled as fish and images of oceans labeled as water. By being trained on this data, the supervised learning algorithm should be able to later identify unlabeled shark images as fish and unlabeled ocean images as water. A common use case of supervised learning is to use historical data to predict statistically likely future events. It may use historical stock market information to anticipate upcoming fluctuations, or be employed to filter out spam emails. In supervised learning, tagged photos of dogs can be used as input data to classify untagged photos of dogs. In unsupervised learning, data is unlabeled, so the learning algorithm is left to find commonalities among its input data. As unlabeled data are more abundant than labeled data, machine learning methods that facilitate unsupervised learning are particularly valuable. The goal of unsupervised learning may be as straightforward as discovering hidden patterns within a dataset, but it may also have a goal of feature learning, which allows the computational machine to automatically discover the representations that are needed to classify raw data. Unsupervised learning is commonly used for transactional data. You may have a large dataset of customers and their purchases, but as a human you will likely not be able to make sense of what similar attributes can be drawn from customer profiles and their types of purchases. With this data fed into an unsupervised learning algorithm, it may be determined that women of a certain age range who buy unscented soaps are likely to be pregnant, and therefore a marketing campaign related to pregnancy and baby products can be targeted to this audience in order to increase their number of purchases. Without being told a “correct” answer, unsupervised learning methods can look at complex data that is more expansive and seemingly unrelated in order to organize it in potentially meaningful ways. Unsupervised learning is often used for anomaly detection including for fraudulent credit card purchases, and recommender systems that recommend what products to buy next. In unsupervised learning, untagged photos of dogs can be used as input data for the algorithm to find likenesses and classify dog photos together. As a field, machine learning is closely related to computational statistics, so having a background knowledge in statistics is useful for understanding and leveraging machine learning algorithms. For those who may not have studied statistics, it can be helpful to first define correlation and regression, as they are commonly used techniques for investigating the relationship among quantitative variables. Correlation is a measure of association between two variables that are not designated as either dependent or independent. Regression at a basic level is used to examine the relationship between one dependent and one independent variable. Because regression statistics can be used to anticipate the dependent variable when the independent variable is known, regression enables prediction capabilities. Approaches to machine learning are continuously being developed. For our purposes, we’ll go through a few of the popular approaches that are being used in machine learning at the time of writing. The k-nearest neighbor algorithm is a pattern recognition model that can be used for classification as well as regression. Often abbreviated as k-NN, the k in k-nearest neighbor is a positive integer, which is typically small. In either classification or regression, the input will consist of the k closest training examples within a space. We will focus on k-NN classification. In this method, the output is class membership. This will assign a new object to the class most common among its k nearest neighbors. In the case of k = 1, the object is assigned to the class of the single nearest neighbor. Let’s look at an example of k-nearest neighbor. 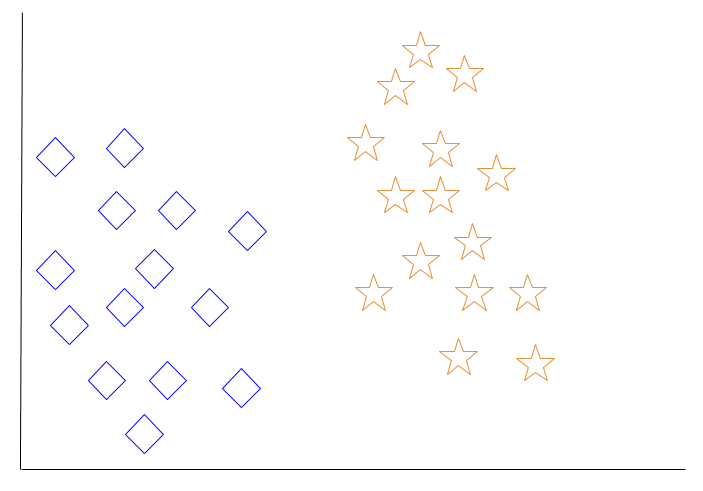 In the diagram below, there are blue diamond objects and orange star objects. These belong to two separate classes: the diamond class and the star class. When a new object is added to the space — in this case a green heart — we will want the machine learning algorithm to classify the heart to a certain class. When we choose k = 3, the algorithm will find the three nearest neighbors of the green heart in order to classify it to either the diamond class or the star class. In our diagram, the three nearest neighbors of the green heart are one diamond and two stars. 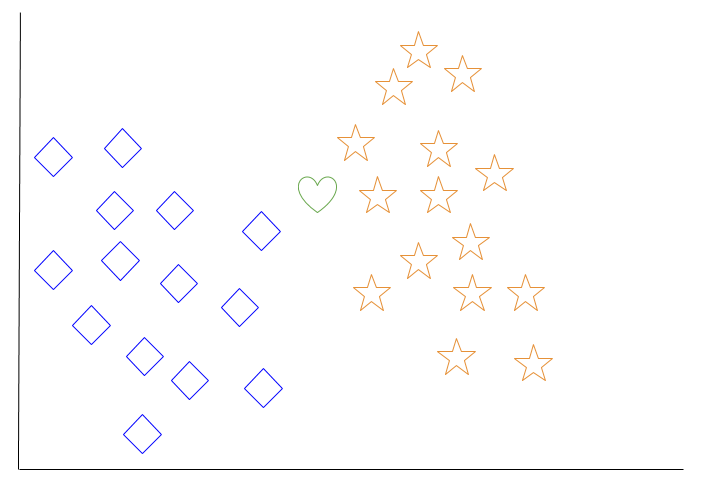 Therefore, the algorithm will classify the heart with the star class. Among the most basic of machine learning algorithms, k-nearest neighbor is considered to be a type of “lazy learning” as generalization beyond the training data does not occur until a query is made to the system. For general use, decision trees are employed to visually represent decisions and show or inform decision making. When working with machine learning and data mining, decision trees are used as a predictive model. These models map observations about data to conclusions about the data’s target value. The goal of decision tree learning is to create a model that will predict the value of a target based on input variables. In the predictive model, the data’s attributes that are determined through observation are represented by the branches, while the conclusions about the data’s target value are represented in the leaves. When “learning” a tree, the source data is divided into subsets based on an attribute value test, which is repeated on each of the derived subsets recursively. Once the subset at a node has the equivalent value as its target value has, the recursion process will be complete. Let’s look at an example of various conditions that can determine whether or not someone should go fishing. This includes weather conditions as well as barometric pressure conditions. In the simplified decision tree above, an example is classified by sorting it through the tree to the appropriate leaf node. This then returns the classification associated with the particular leaf, which in this case is either a Yes or a No. The tree classifies a day’s conditions based on whether or not it is suitable for going fishing. A true classification tree data set would have a lot more features than what is outlined above, but relationships should be straightforward to determine. 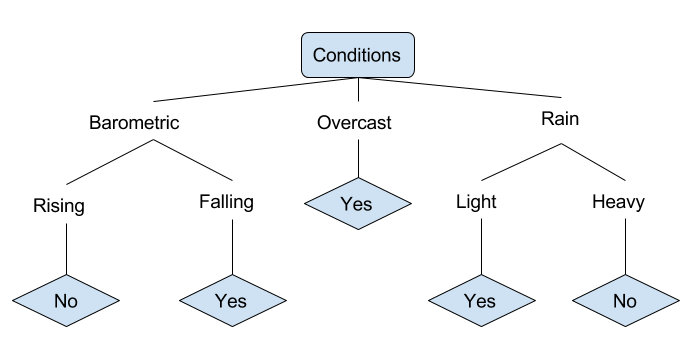 When working with decision tree learning, several determinations need to be made, including what features to choose, what conditions to use for splitting, and understanding when the decision tree has reached a clear ending. Deep learning attempts to imitate how the human brain can process light and sound stimuli into vision and hearing. A deep learning architecture is inspired by biological neural networks and consists of multiple layers in an artificial neural network made up of hardware and GPUs. Deep learning uses a cascade of nonlinear processing unit layers in order to extract or transform features (or representations) of the data. The output of one layer serves as the input of the successive layer. In deep learning, algorithms can be either supervised and serve to classify data, or unsupervised and perform pattern analysis. Computer vision and speech recognition have both realized significant advances from deep learning approaches. IBM Watson is a well-known example of a system that leverages deep learning. When choosing a language to specialize in with machine learning, you may want to consider the skills listed on current job advertisements as well as libraries available in various languages that can be used for machine learning processes. From data taken from job ads on indeed.com in December 2016, it can be inferred that Python is the most sought-for programming language in the machine learning professional field. Python is followed by Java, then R, then C++. Python’s popularity may be due to the increased development of deep learning frameworks available for this language recently, including TensorFlow, PyTorch, and Keras. As a language that has readable syntax and the ability to be used as a scripting language, Python proves to be powerful and straightforward both for preprocessing data and working with data directly. The scikit-learn machine learning library is built on top of several existing Python packages that Python developers may already be familiar with, namely NumPy, SciPy, and Matplotlib. Java is widely used in enterprise programming, and is generally used by front-end desktop application developers who are also working on machine learning at the enterprise level. Usually it is not the first choice for those new to programming who want to learn about machine learning, but is favored by those with a background in Java development to apply to machine learning. In terms of machine learning applications in industry, Java tends to be used more than Python for network security, including in cyber attack and fraud detection use cases. Among machine learning libraries for Java are Deeplearning4j, an open-source and distributed deep-learning library written for both Java and Scala; MALLET (MAchine Learning for LanguagE Toolkit) allows for machine learning applications on text, including natural language processing, topic modeling, document classification, and clustering; and Weka, a collection of machine learning algorithms to use for data mining tasks. R is an open-source programming language used primarily for statistical computing. It has grown in popularity over recent years, and is favored by many in academia. R is not typically used in industry production environments, but has risen in industrial applications due to increased interest in data science. Popular packages for machine learning in R include caret (short for Classification And REgression Training) for creating predictive models, randomForest for classification and regression, and e1071 which includes functions for statistics and probability theory. C++ is the language of choice for machine learning and artificial intelligence in game or robot applications (including robot locomotion). Embedded computing hardware developers and electronics engineers are more likely to favor C++ or C in machine learning applications due to their proficiency and level of control in the language. Some machine learning libraries you can use with C++ include the scalable mlpack, Dlib offering wide-ranging machine learning algorithms, and the modular and open-source Shark. Although data and computational analysis may make us think that we are receiving objective information, this is not the case; being based on data does not mean that machine learning outputs are neutral. Human bias plays a role in how data is collected, organized, and ultimately in the algorithms that determine how machine learning will interact with that data. If, for example, people are providing images for “fish” as data to train an algorithm, and these people overwhelmingly select images of goldfish, a computer may not classify a shark as a fish. This would create a bias against sharks as fish, and sharks would not be counted as fish. When using historical photographs of scientists as training data, a computer may not properly classify scientists who are also people of color or women. In fact, recent peer-reviewed research has indicated that AI and machine learning programs exhibit human-like biases that include race and gender prejudices. See, for example “Semantics derived automatically from language corpora contain human-like biases” and “Men Also Like Shopping: Reducing Gender Bias Amplification using Corpus-level Constraints” [PDF]. As machine learning is increasingly leveraged in business, uncaught biases can perpetuate systemic issues that may prevent people from qualifying for loans, from being shown ads for high-paying job opportunities, or from receiving same-day delivery options. Because human bias can negatively impact others, it is extremely important to be aware of it, and to also work towards eliminating it as much as possible. One way to work towards achieving this is by ensuring that there are diverse people working on a project and that diverse people are testing and reviewing it. Others have called for regulatory third parties to monitor and audit algorithms, building alternative systems that can detect biases, and ethics reviews as part of data science project planning. Raising awareness about biases, being mindful of our own unconscious biases, and structuring equity in our machine learning projects and pipelines can work to combat bias in this field. This article reviewed some of the use cases of machine learning, common methods and popular approaches used in the field, suitable machine learning programming languages, and also covered some things to keep in mind in terms of unconscious biases being replicated in algorithms. Because machine learning is a field that is continuously being innovated, it is important to keep in mind that algorithms, methods, and approaches will continue to change.